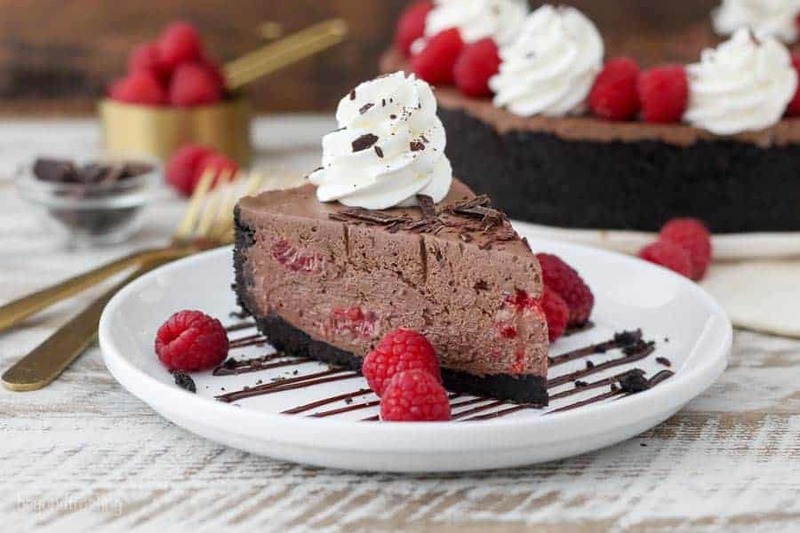 This No-Bake Chocolate Raspberry Cheesecake is a creamy dark chocolate no-bake cheesecake with a fresh raspberry swirl and chunks of raspberries. Errrrr my gosh you guys, this cheesecake, I can’t even handle it. 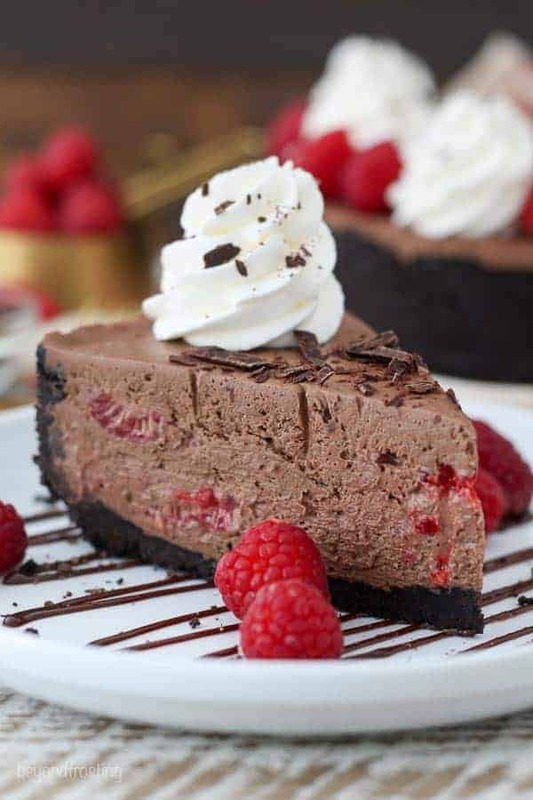 It’s like I forgot how good my best ever no-bake chocolate cheesecake is because I fell in love all over again with his baby. 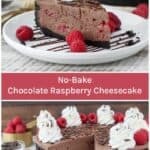 Last summer, I made a white chocolate raspberry swirl cheesecake and I didn’t even give it a second thought when I decided I needed a chocolate version. Of all the summer berries, raspberries are my favorite. At my house in Vermont my parents had huge gardens lining our property, and part of that included quite a large raspberry patch. We always had more raspberries than we knew what to do with. I remember how much I loved to go grab some straight off the vines while trying to avoid all the bees that were flying around! 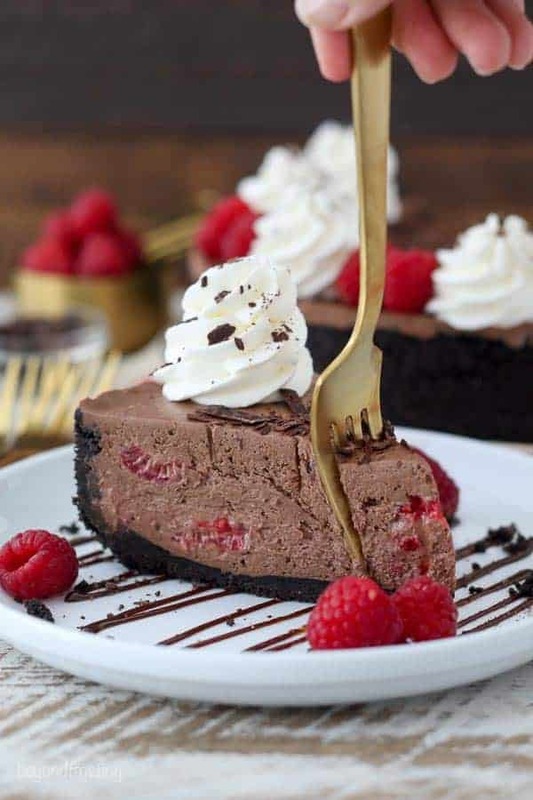 I knew that a simple swirl of raspberry puree would not be enough for this cheesecake, so I sliced up some whole raspberries and tossed them into the cheesecake as well. This is where the flavor really shines through. I am pretty good at resisting my own desserts, but I cut a quarter of this cheesecake and saved it for my dad because he would be visiting me the following week. I’m definitely guilty of sneaking a few bites of this for myself, but I simply could not resist. I loved that no matter how much food we ate for dinner, my dad cut himself a slice of cheesecake every night until it was gone. What can I say? The man loves his desserts. 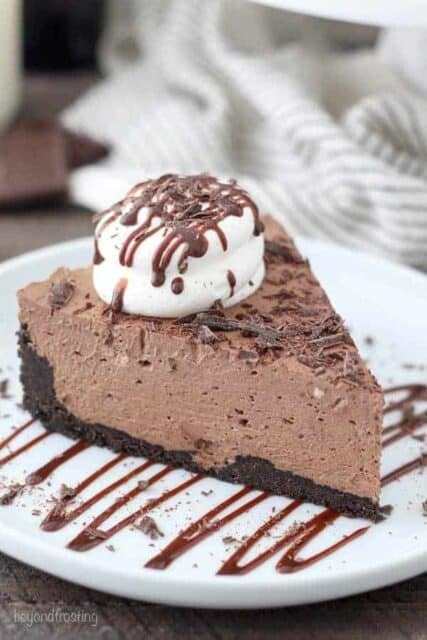 Okay so to make this dessert, you first need to prepare your crust in a 9-inch springform pan or an 9-inch square pan, just make sure it’s 3 inches tall or you’ll be right up to the tippy top. 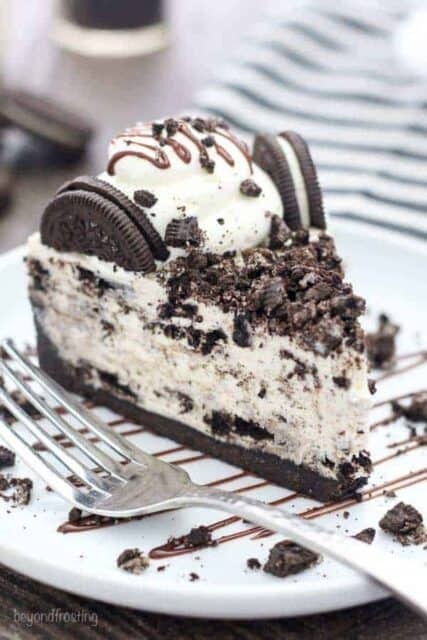 I prefer Oreos for the crust because they hold together so nicely, which makes for a very sturdy crust. 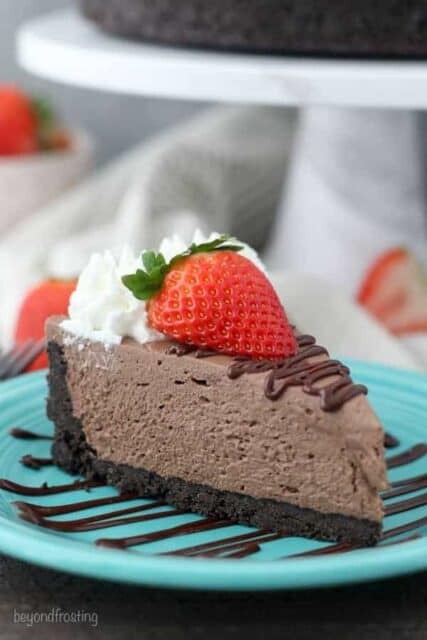 For the cheesecake filling, you have the usual suspects: cream cheese (be sure to use full-fat), sugar, cocoa powder, whipped cream and melted chocolate. The melted chocolate really is the driving force behind the flavor here, so it’s important that you use a high-quality chocolate, and I prefer dark chocolate myself. You can use chocolate chips, but I find that chocolate bars melt the best. I don’t like doing dishes, so first I prefer the whipped cream and then scoop it into a bowl (that can go in the dishwasher- duh), then I make my cheesecake filling in the same bowl. My best advice I can give you is to make sure your cream cheese is somewhat soft, or well beaten so that it’s easier to incorporate the other ingredients. Last but certainly not least is the raspberry sauce. First, puree 3 ounces of berries in a small food processor, or just smash them in a bag. You can decide if you want to strain out the seeds or just leave them in. 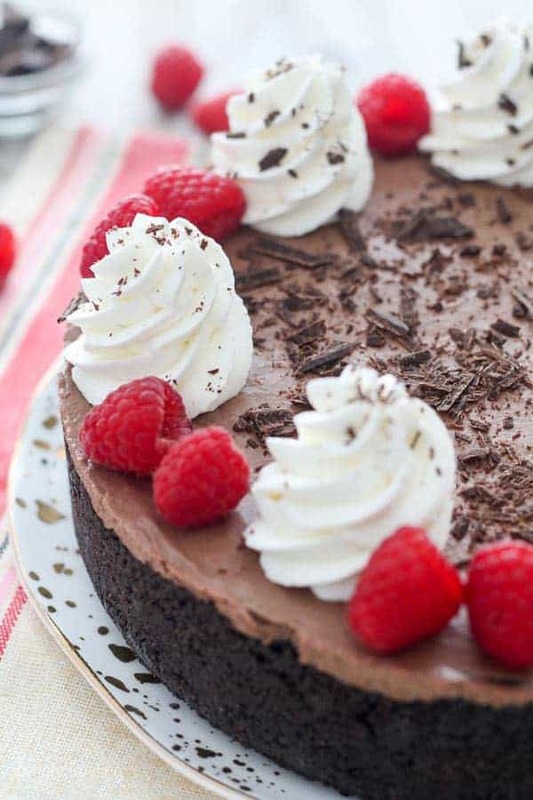 Next, you’ll slice some raspberries in half to layer in the dessert. Since the cheesecake batter is pretty heavy, I like to layer these in once I add the cheesecake batter to the pan. First add 1/3 of the cheesecake batter to the crust, spread it evenly, then drizzle in about 1/3 of your raspberry puree. Gently swirl it with the knife, then place some sliced raspberries in there. Repeat and repeat again. The reason I don’t just use the puree is because I don’t think it’s enough raspberry flavor for me. I don’t want to puree all the raspberries because the additional liquid makes it difficult for the cheesecake to set properly. For the topping you can garnish however you’d like. I chopped up some of my leftover chocolate bar, made some whipped cream and added more berries. There you have it folks. 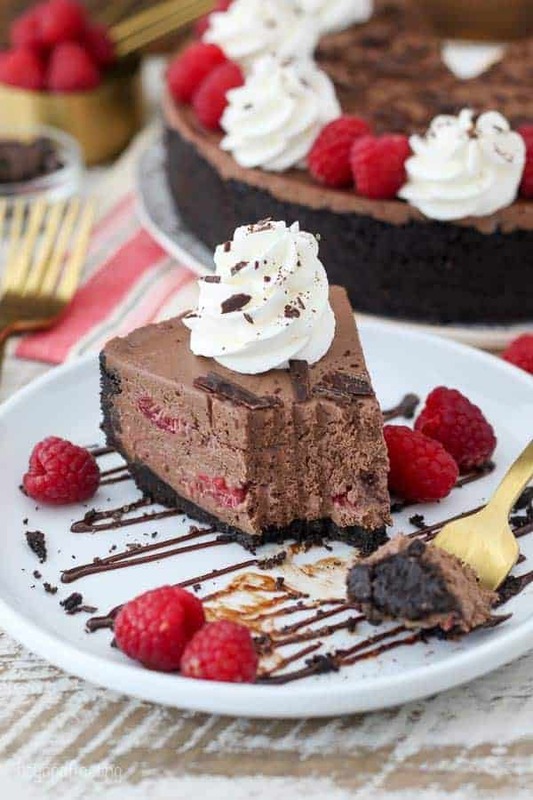 I wouldn’t blame you if needed to go make this Chocolate Raspberry Cheesecake right NOW! 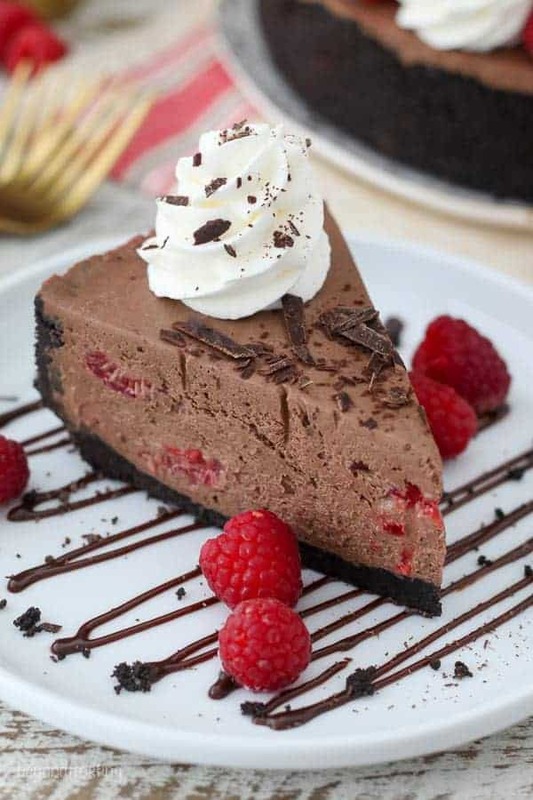 This looks amazing — that texture looks absolutely perfect and I feel like raspberries don’t get enough dessert love the the summer months. Excited to try it!